SAA Architects (SAA) celebrated its 50th Anniversary with the launch of their book titled “Urbanistic, Humanistic, Optimistic” on 28 August 2015. The celebration was graced by the presence of Guest-of-Honour, Mrs Christina Chia (SAA’s late founder’s wife), Dr Wong Yunn Chii (Head of Architecture, NUS), past partners, SAA regional offices’ group leaders, clients, consultants and friends of SAA. The SAA book showcases a selection of large-scale works that have been designed and built over the past 10 years, work in progress and conceptual architectural work. SAA’s works gravitate towards architecture that exudes strong civic characteristics which the public can better use and appreciate, such as Changi Airport Terminal 4, Lifelong Learning Institute and One Raffles Place. True to the company’s philosophy of “Building Dreams, Enriching Lives”, SAA launched a $500,000 EnReach Study grant with the National University of Singapore (NUS) as part of their 50th anniversary celebration. 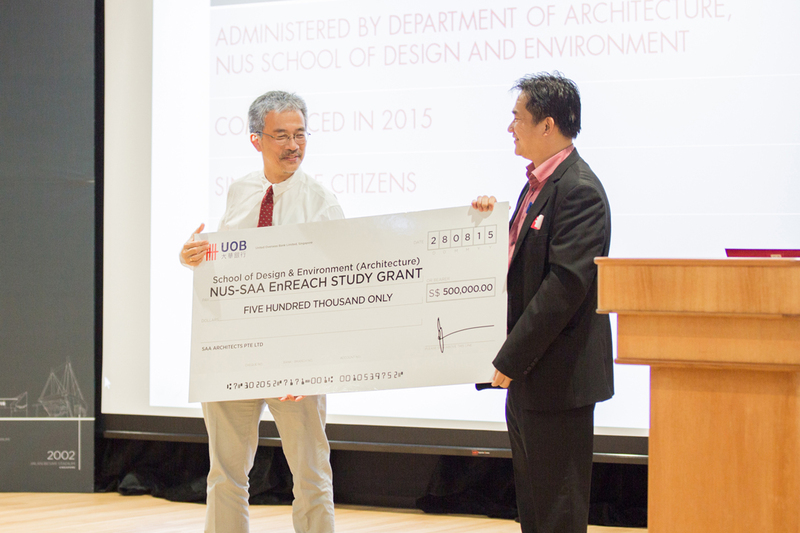 The SAA-NUS EnReach Study grant provides financial assistance to underprivileged students in their Year 3 and 4 architectural studies and comprises bursaries worth S$5000 each to be awarded to four students from the NUS School of Design and Environment (SDE) annually. This gesture is part of their effort to give back to society by supporting the education of our local architecture students.